Portland, Oregon (Nov. 21, 2017) Ryan Bradley, ND, MPH, has been appointed director of NUNM’s Helfgott Research Institute, with responsibility for the continuing development, implementation and delivery of all research projects and activities within the university. Bradley joined NUNM in 2014 as assistant director of NUNM’s Helfgott Research Institute and associate professor of nutrition and cardiology. He received his ND at Bastyr University in 2003, and his Master of Public Health in Epidemiology from the University of Washington (UW) in 2009. After completing his clinical residency at Bastyr, he spent three years as a National Institutes of Health (NIH) CAM research trainee, and then five years in the KL2 program at UW in the Division of Cardiology, where he studied multidisciplinary clinical and traditional research methods. 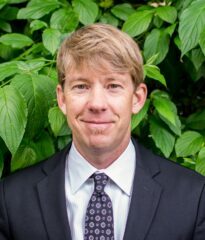 Bradley’s background includes serving as assistant professor of preventive medicine in the School of Medicine at the University of California, San Diego; associate professor of pharmaceutics in the School of Pharmacy at the University of Washington in Seattle; and visiting faculty at the University of Technology Sydney: Australian Research Centre in Complementary and Integrative Medicine. He also spent 10 years at Bastyr as a member of its clinical and research faculty, and was director of the Center for Diabetes and Cardiovascular Wellness. Bradley has an international reputation for his scientific research in integrative medicine. He has conducted numerous clinical and observational research studies, is the recipient of many research grants, and has been published in leading peer-reviewed research and clinical journals. The co-author of scientific abstracts, books and chapters on integrative cardiology, cardiovascular disease, and nutrition, he is a frequent speaker at scientific conferences in the United States and throughout the world. In addition, Bradley represents NUNM at the International Research Consortium of Naturopathic Academic Clinics and the World Naturopathic Federation, among others. Bradley successfully helped launch the NIH-funded BRIDG T90/R90 clinical research training program now underway with the University of Washington, which is providing multidisciplinary training in research, clinical care and complementary and integrative health to both natural medicine providers and conventionally trained researchers in biomedical and public health disciplines.